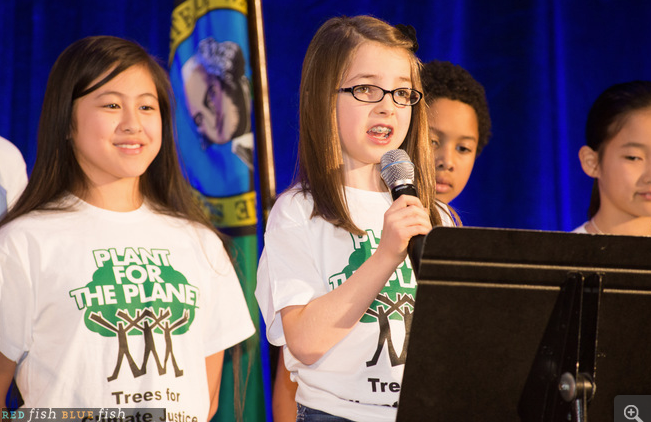 Jenny Abby Adonis and Miku addressing a magnificent fundraiser with VP Al Gore for Governor Inslee December 2014. An inspiring day of climate champions! 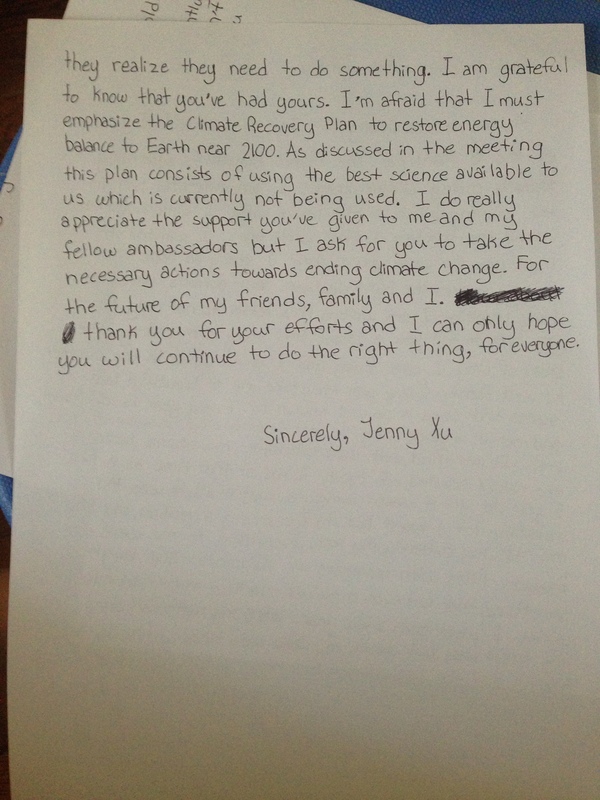 When Jenny moved away from Seattle, it meant she could no longer take part in the kids’ climate lawsuit asking our Washington Dept of Ecology for clear emissions targets to protect her generation. 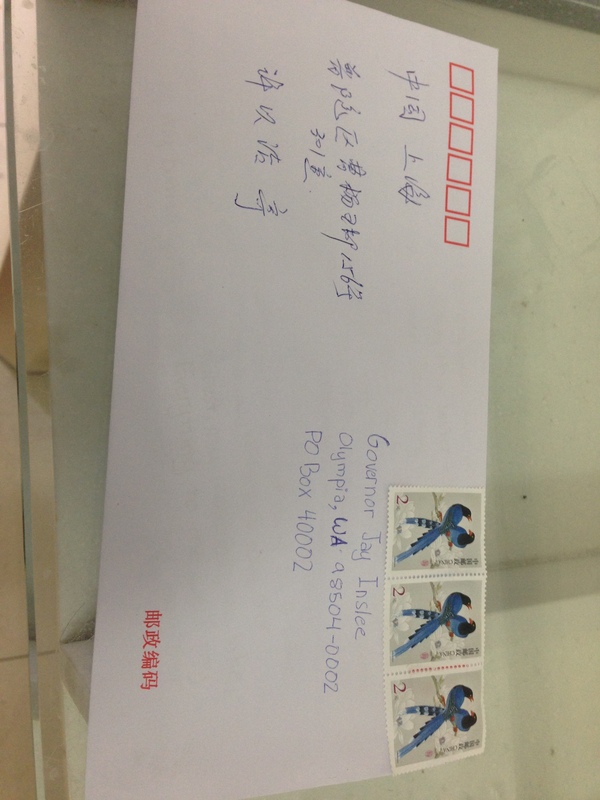 So she made her voice heard from China by writing a beautiful letter instead. “Hi, my name is Jenny and I’m 12 years old. 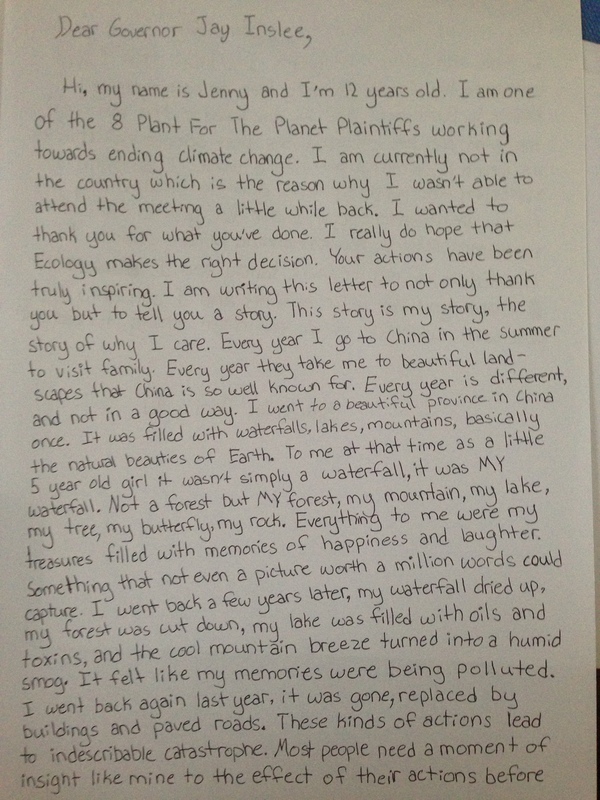 I am one of the 8 Plant for the Planet Plaintiff’s working towards ending climate change. I am currently not in the country which is the reason why I wasn’t able to attend the meeting a little while back. I wanted to thank you for what you’ve done. I really do hope that Ecology makes the right decision. Your action have been truly inspiring. I am writing this letter to not only thank you but to tell you a story. This story is my story, the story of why I care. Every year I go to China in the summer to visit family. Every year they take me to beautiful landscapes that China is well known for. Every year is different, and not in a good way. I went to a beautiful province in China once. I was filled with waterfalls, lakes, mountains, basically the natural beauties of Earth. To me at that time as a little 5 year old girl it wasn’t simply a waterfall, it was MY waterfall. Not a forest but MY forest, my mountain, my lake, my tree, my butterfly, my rock. Everything to me were my treasures filled with memories of happiness and laughter. Something that not even a picture worth a million words could capture. I went back a few years later, my waterfall dried up, my orest was cut dow, my lake was filled with oils and toxins, and the cool mountain breeze turned into a horrid smog. If felt like my memories were being polluted. I went back again last year, it was gone, replaced by buildings and paved roads. These kids of actions lead to indescribable catastrophe. Most people need a moment of insight like mine to the effect of their actions before they realize they need to do something. I am grateful to know that you’ve had yours. I’m afraid that I must emphasize the Climate Recovery Plan to restore energy balance to Earth near 2100. As discussed in the meeting this plan consists of using the best science available to us which is currently not being used. I do really appreciae the support you’ve given to me and my fellow ambassadors but I ask for you to take the necessary actions towards ending climate change. For the future of my friends, family and I. Thank you for your efforts and I can only hope you wil continue to do the right thing, for everyone. Why are the kids back in court now? To update scientific targets for Climate Recovery in order to protect their generation. People always ask, “Is it too late?” Yes if we continue to do nothing. But not yet, if we do two things which is why kids are suing now. If we can reduce CO2 in the air below 350ppm from 400ppm CO2 where it is today, then we restore energy balance to the biosphere. To aim for energy balance is the bare legal and moral minimum that we can do to take care of our kids and the next seven generations. The only way to reach 350ppm is with immediate bold action to reduce emissions 4% yrly in Washington (double the rate Ecology aims for), 6% nationally, and plant over 1 trillion trees worldwide to reabsorb about 10 years of human pollution back into the ground as soon as possible over the next few decades. There are 3.04 trillion trees alive on Earth today. Let’s make it 4 trillion! It will get hotter and weirder until 2050 but, if we follow science and act right now to cut pollution, it might be as cool as it was in the 1980’s by 2070. For this to work, we must each do our part at home too. Set a goal to pollute 6% – 10% less each year at your house. Talk with your family about fun ways to do things without wasting energy. Make it your #1 family project. Set a goal to live carbon-free someday and let it inspire you. It can be fun to think of different ways to do things instead of the same old habits. Use human power. That’s the solution we can live with. Plant trees, plant food, tell your neighbors and your leaders to act now for all of us. Thanks Jenny for a great letter. I’m sure your personal story made an impression on Governor Inslee. Previous Previous post: Victory for today’s young people and all living things to come. Now take action!